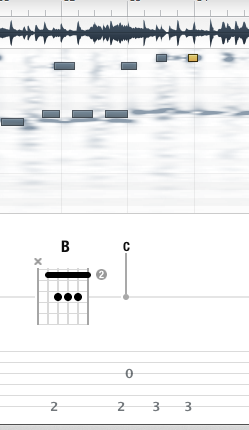 As TechCrunch’s resident guitarist/horrible guitarist, I enjoy apps like Capo. The $29 program allows you to “reverse engineer” any song in your iTunes library, allowing you to play along by marking out your own tablature, playing the chords the app senses in the music, or by looping and slowing down tricky parts of the song. How does it work? I recorded a bit of “Creep” by Radiohead, strumming away, Rock Band-style, to the chords offered by the app. The song consists of four chords – G, B7, C, and Cm – and you usually play barre chords in the 3rd or 4th position. Capo “found” most of the chords, offering up good approximations for what was going on in the music and serving up imperfect but acceptable alternatives to the real notes. You can hear me below. Arguably it wasn’t perfect – it dropped some B minor and D chords in there for kicks – but it was enough to get you started. If I were a beginner I’d wonder why things didn’t sound exactly right but it would be easy enough to fix things with a little practice and research. The same thing happened with a number of other songs. Surprisingly Icona Pops “I Love It” came out the best with excellent chord recognition off the bat. One of the best features is the pitch and speed shifters. You can reduce the speed to 1/4, allowing you to listen to the guitar parts and learn solos by playing and repeating the parts you’re having trouble with. There are similar apps that do these same things (Riffstation is one) but this update to Capo seems to have really nailed usability. It’s not perfect – the tab system requires you to swipe over a spectrogram of the song to tell it which notes to pick out and the process is quite imprecise. However, with a bit of practice and the right song I’m sure it can get a bit easier. Capo is a cool tool for amateur guitarists and an interesting toy for professionals. As I so often say when I try stuff like this if I’d had Capo and a nice Stratocaster when I was in high school I’d probably never have gone to class.